We do not curently have theatre tickets available for Hershey Felder Our Great Tchaikovsky This could be because we have simply sold out or it could be that this show is no longer running. The information on this page remains purely for historical and informational purposes. 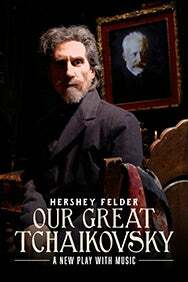 Hershey Felder’s Our Great Tchaikovsky is a time-bending tale of music, politics and one of the world’s most beloved composers. Known for the beautiful ballets Sleeping Beauty, Swan Lake and The Nutcracker, and the ferocious and melodic brilliance of his symphonic works, piano concerti, overtures, operas and chamber music, a healthy 53-year-old Tchaikovsky conducted the premiere of his enigmatic Symphony No. 6, “Pathétique” and, nine days later, he was dead. To this day, how and why he died is still a mystery. An award-winning actor and musician Hershey Felder created and directed last season’s sell-out hit, ‘The Pianist of Willesden Lane’ and now returns direct from an acclaimed US Tour with his unique and moving blend of piano virtuosity and musical biography.